Hey everyone! 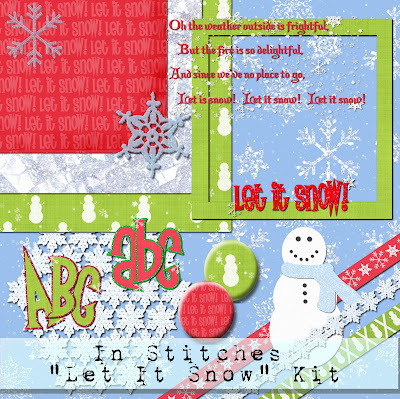 Today I have the alphas for the "Let It Snow" kit. I like my alphas on one big sheet. This way I only have to open up one file, and I can keep going to it to copy and paste the letters. It seems simpler to me. Anyway, if you don't like my set up, I apologize ahead of time. Think of it this way; it's less to download :) One alpha is upper case and the other lower. Click on the preview to download. Again, I'd love to see what you guys make with the kit, so please leave me the links.